John's two disciples found Jesus and said to him, "John the Baptist sent us to ask, 'Are you the Messiah we've been expecting, or should we keep looking for someone else?'" At that very time, Jesus cured many people of their diseases, illnesses, and evil spirits, and he restored sight to many who were blind. Then he told John's disciples, "Go back to John and tell him what you have seen and heard — the blind see, the lame walk, those with leprosy are cured, the deaf hear, the dead are raised to life, and the Good News is being preached to the poor." And he added, "God blesses those who do not fall away because of me." I used to remind preaching students, "God could use a donkey to speak his will, so simply having a message from God doesn't make us all that unique." I was referring to Balaam's donkey, of course (Numbers 22). 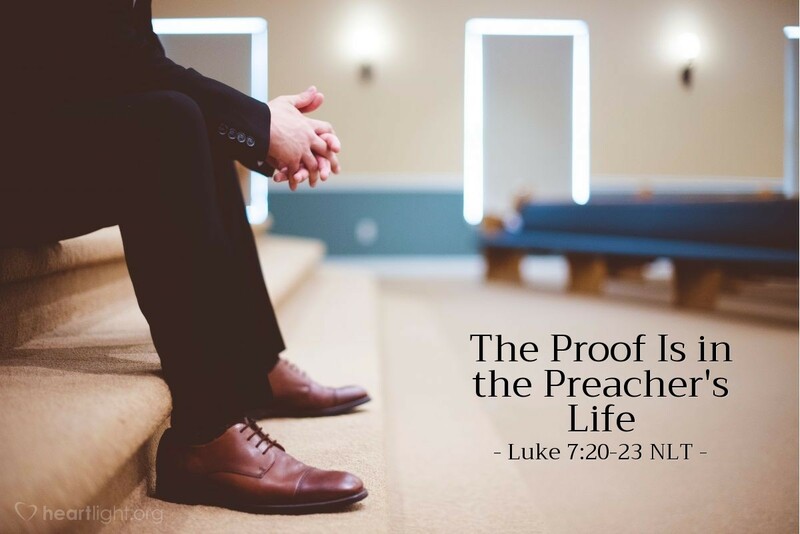 What makes the messenger important for God is when the message and the messenger's life line up. In today's verses, Jesus reached back and used the less-known language about the Messiah and his service to the lost, forgotten, and needy to remind John that he, Jesus, is the Christ of God. To help reinforce his claim, he asked John's disciples to report to John what they saw him do and heard him say. Jesus was what he said, and Jesus did what the prophets proclaimed he would do. John's words were right when he had talked about the Messiah, even if his personal expectations of all that the Messiah would do were not quite what Jesus did. In our weaker moments, we may want a Messiah that is a little different than Jesus — one who is not so straight talking about obedience and not so demanding about discipleship. But, Jesus did the will of God, doing and saying what God wanted him to do and say. It is not Jesus who needs to change, but our expectations and our behaviors! Holy God, who so lovingly sent your Son to be my Savior, open my mind and my heart to know and understand who Jesus is and who he wants me to be. In the name of your Son, Christ Jesus my Lord, I pray. Amen.